0:11Skip to 0 minutes and 11 secondsCRAIG HASSED: Well, Richard, it's not so easy to be mindful in the modern day. In fact, sometimes I feel like we're being driven to distraction. So what happens when we're not mindful, when we are not present? What's it called? 0:24Skip to 0 minutes and 24 secondsRICHARD CHAMBERS: The name for it is default mode. It's default mental activity. And what the research is showing up when we're not actually engaged and present with what we're, doing our minds just very naturally click off into this default mode. And that's that mind wandering mental chatter, the judgement, the self criticism-- that kind of thing that we just find ourselves in throughout the day. 0:44Skip to 0 minutes and 44 secondsCRAIG HASSED: Is this default mode good or bad for our brains in the long term? 0:48Skip to 0 minutes and 48 secondsRICHARD CHAMBERS: Look, it's not a good nor bad, but when it's activated too much, it's definitely been found to be a risk factor for a whole range of different problems. I mean stress, obviously, as we spend too much time worrying about what if rather than actually focused on what is. Anxiety, depression for the same reasons. 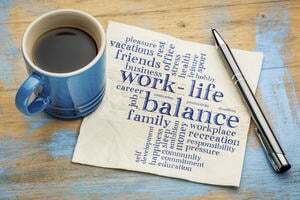 It'ss associated with reduced performance, cognitive performance, and therefore, impaired work performance and study performance. So it definitely has a lot of problems associated with it. And of course, closely related to it is when, in fact, you can sort of say it's the same thing-- it's that automatic pilot. 1:20Skip to 1 minute and 20 secondsAnd you probably noticed how much of the time we just do things on automatic without really paying much attention. And again, it's neither inherently good or bad, but you probably know the experience of walking into your house, maybe putting down your keys, thinking of something else, and then you've got to leave and it's like, where are my keys. That kind of thing. Or a lot of people sitting in a lecture or sitting in a meeting and just not paying attention. Kind of away with the fairies. Missing important information, may be damaging the quality of the communication in that moment as well. Yeah. 1:47Skip to 1 minute and 47 secondsCRAIG HASSED: I kind of think that the pace of life is speeding up all the time. And not just at work but at home. Sort of hyper kinetic environment. So what's that about and what effect does that have on our ability to pay attention? 2:00Skip to 2 minutes and 0 secondsRICHARD CHAMBERS: Well, life is definitely getting faster, isn't it. And we're expected to do more and more with less and less. There's this pervasive mentality that we should be able to multitask and do multiple things at the same time. And of course, what that does is it creates a sort of distracted attention where we're never really focused on what we're doing at any given moment. Maybe doing one thing and thinking of five other things. 2:21Skip to 2 minutes and 21 secondsCRAIG HASSED: Is that what they call attention deficit trait? 2:23Skip to 2 minutes and 23 secondsRICHARD CHAMBERS: That's a name that's been given to it now. We're finding in the research, again, that workers who are constantly bombarded with distractions, phone calls, knocks on the door-- they're actually activating their amygdala so much that they get into a sort of a chronic fight or flight response. We're calling it attention deficit trait. It's different to attention deficit disorder, which is, of course, a psychological disorder and a combination of environmental and psychological factors. This is actually purely environmental. It's just being bombarded with too much information and it impairs critical thinking. We lose perspective. We're unable to plan effectively. So people who are trying to do too much are actually not functioning well at all. 3:07Skip to 3 minutes and 7 secondsCRAIG HASSED: So this stress is going up but the performance starts to go down. 3:10Skip to 3 minutes and 10 secondsRICHARD CHAMBERS: That's absolutely right. 3:11Skip to 3 minutes and 11 secondsCRAIG HASSED: It would have to be a lose-lose situation. 3:13Skip to 3 minutes and 13 secondsRICHARD CHAMBERS: It's pretty much a lose-lose. 3:15Skip to 3 minutes and 15 secondsCRAIG HASSED: I dare say one of the things we try and do is deal with that kind of environment is to do it all at the same time-- i.e. multitasking. Is that a good policy or bad policy? Does it become part of the solution or does it become part of the problem? 3:29Skip to 3 minutes and 29 secondsRICHARD CHAMBERS: Look, it's definitely part of the problem. The term multitasking is actually a misnomer, it's an illusion. 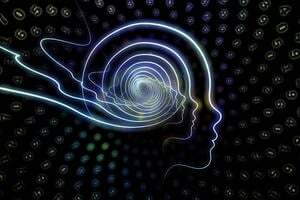 The brain processes information in serial, which means one thing after another. And we are physically incapable of actually processing two complex stimuli at the same time. So when we're driving a car for instance and talking on the phone, even if we're on hands free, our attention is going from the driving to the conversation back to the driving, backwards and forwards. 3:55Skip to 3 minutes and 55 secondsCRAIG HASSED: It's so fast that it sort of creates an illusion of paying attention to two things. 3:59Skip to 3 minutes and 59 secondsRICHARD CHAMBERS: That's right. You might think one of those animated flip books. It's going backwards and forwards so fast that it seems like we're doing both things at once, but actually we're not. We're always focusing on one thing at a time. And that's why if you're deep in conversation and something jumps out in front of your car, the reaction time is just that little bit slower. Or if you make a right hand turn and really concentrating and someone says something really important, you might have to ask them to repeat it. 4:21Skip to 4 minutes and 21 secondsCRAIG HASSED: Right. And so, what happens with that? Are we more likely to make errors? Are we more likely to feel stressed? And is there a difference between multitasking and maybe efficiently switching our attention? 4:35Skip to 4 minutes and 35 secondsRICHARD CHAMBERS: Yeah, we can definitely learn to efficiently switch our attention. What seems to work-- what the research shows is when we focus on one thing at a time, we actually become less stressed and more productive. Of course, when we're trying to multitask, if our attentions on one thing, it's not on the other thing. 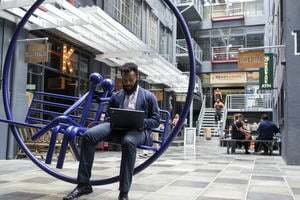 And so when we're trying to do some work and communicate at the same time or if we're on our phone for instance, we're actually losing time as we switch our attention to something else. And there's a phenomenon called the attentional blink, which is pretty interesting as well. 5:07Skip to 5 minutes and 7 secondsAnd what that shows is every time we switch our attention from one thing to another, there's a really brief pause. It's quite short-- between one 0.2 up to half a second-- 0.5 of the second. The more stressed we are, the longer the attentional blink is. And during this time, we're actually not paying attention to anything at all. 5:23Skip to 5 minutes and 23 secondsCRAIG HASSED: Just like a blank screen as you shift from one computer program to another. 5:28Skip to 5 minutes and 28 secondsRICHARD CHAMBERS: It's exactly that. It's a blank screen. It's dead time. We know this because if we flash up shapes on a computer screen and get you to press a button every time you saw a shape, if we put up a shape and then within 0.2 of a second put up another one, you literally wouldn't see it. Your attentional system would be blinking off line just while that second shape came up. Then you'd be back and you'd be like, which shape, right? And of course, this has implications because if we're working in a way where we got multiple tabs open on our computer and the alerts are still turned on on our phone, for instance. 5:57Skip to 5 minutes and 57 secondsCRAIG HASSED: Attention is going there and there. 5:58Skip to 5 minutes and 58 secondsRICHARD CHAMBERS: Backwards and forwards. It's switching back and forth. And we're losing half a second, half a second, half a second each time we switch our attention. 6:04Skip to 6 minutes and 4 secondsCRAIG HASSED: And losing the flow of the activity that we're engaged in. 6:07Skip to 6 minutes and 7 secondsRICHARD CHAMBERS: Of course. Making mistakes, losing track, and of course, it stresses us out. 6:14Skip to 6 minutes and 14 secondsCRAIG HASSED: What about media? I mean, we've got so much technology these days, which on one level, I think, can be a pretty good servant if it's used well. But I think sometimes it must be becoming a little bit of a tyrannical master. What's the issues around modern technology and screen time and attention? 6:34Skip to 6 minutes and 34 secondsRICHARD CHAMBERS: Well, as we've already said, it's about how we use it. Technology is not a good or bad. I mean, if we think of nuclear power, fire, language-- it's all about how we use it. And so it does actually does help us to be more connected, to be more efficient in some ways. But it also encourages distraction. It encourages this sort of so-called multitasking mentality. So we might be in the middle of doing one thing and then bing, in comes a little sort of invitation in the top right corner of the screen to switch our attention to something else. And we might start doing that. And bing, there's another invitation again. 7:04Skip to 7 minutes and 4 secondsSo technology used improperly can actually contribute to this distractedness reactivity as we just post things online without really thinking about it beforehand. 7:17Skip to 7 minutes and 17 secondsCRAIG HASSED: So it sounds like in terms of developing mindfulness, it's going to be more than just practicing some mindfulness meditation exercises and so on. It's going to have a lot to do with how we manage the environment and how we become aware of some of these, perhaps we could say enemies of attention and manage those situations as well. 7:35Skip to 7 minutes and 35 secondsRICHARD CHAMBERS: Definitely. Practicing mindfulness formally through meditation practices, informally towards applications-- that's the ground, that's the base and it's very important. But it's also important that we do start to use technology much more effectively by, for instance, turning of the alerts on our computer. Doing one thing at a time. And making sure that we practice being attentive and focused rather than distracted. Default mode is the distracted state of mind we go into when we are not mindful or engaged with the present moment. It is associated with being on automatic pilot. 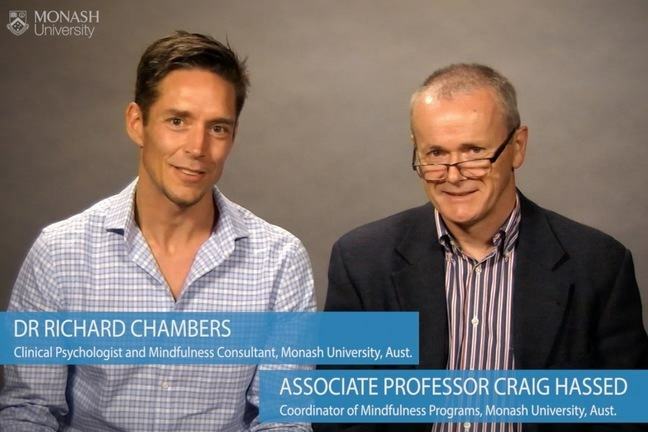 Watch Craig and Richard discuss the concept of default mode and how it contributes to reduced wellbeing and performance. In the Comments, consider sharing with other learners your thoughts on mindfulness. You may want to talk about some of the areas of your life that you think could be improved by mindfulness. If you’d like to know more about mindfulness, go to See also for a link to a video featuring clinical mindfulness expert, Jon Kabat-Zinn giving an operational definition of mindfulness. Accessing this additional material is entirely optional.